and a storyline to their drum corps programming. The drum corps activity has gone through a lot of changes during the past several years; different keyed brass instruments, amplification and electronics being some of the most obvious. Many of those currently marching in a Drum Corps International group might be surprised at just how different drum corps today is compared to just 20 years ago. But go back to the founding of DCI in 1972—and a bit earlier—and you'll start to see some even more radical differences. What seems revolutionary in comparing drum corps then-to-now was more a series of evolutions: One-valve bugles gave way to valve and rotor combinations and then two-valve horns. Calfskin drum heads that didn't perform well in all weather conditions got replaced with synthetic materials like plastic and eventually Mylar and Kevlar. Single tenor drums became double tenors before becoming racks of trios, quads, quints and more. Even during Drum Corps International's earliest years, there were no mallet keyboards in the percussion section. Setting any equipment on the ground, including percussion instruments, rifles and flags, was strictly forbidden. Flags of just one design for an entire show were marched ramrod straight throughout a production, then made an occasional dip and sway to the side before spinning and catches became the norm. The heritage of what we know as "drill," the formations corps members march into on the field, early on consisted of corps starting from the left goal line and moving across the field in straight lines. After arriving at the center of the field, they'd eventually retreat to the right goal line before turning around for one last blast to the audience in the stands. Corps were typically much smaller than the maximum of 150 members allowed today. It would not be unusual to be able to stuff the membership of three complete drum corps into a full-sized contemporary ensemble. Until the Troopers created a national touring model in the late 1960s—due to the necessity of traveling to other regions in order to compete—a trip of two hours was considered a major excursion. The rules governing the VFW competitions were often different than those of the American Legion, and sometimes rules changed without any input from the competing units and without any notice. Most U.S. corps didn't attend the biggest shows of the season, which were the national competitions overseen by the VFW and American Legion at their national conventions. Even those corps that aspired to attend the national championships didn't attend every one, as the conventions continually moved all over the country, from Boston to Los Angeles, Miami to Seattle and even Honolulu. The rules governing the VFW competitions were often different than those of the American Legion, and sometimes rules changed without any input from the competing units and without any notice. Corps might arrive at a competition and learn they couldn't perform as they had prepared without first making certain changes on the spot. Penalties were sometimes assessed at Finals for things that were okay earlier in the day during Prelims. Corps also had to vary the length of their performances from Prelims to Finals. With so many groups to get onto the field early in the day, they'd take their regular productions of around 11 minutes and toss out major chunks. Much of the visual program would be rewritten to whittle their Prelims shows down to four to six minutes. For a taste of what the drum corps activity was like prior to the formation of Drum Corps International more than 40 years ago, we've pulled together the following video sampler for your enjoyment. These clips may bring back a flood of memories for longtime fans, and they'll perhaps open the eyes of a later generation who might already classify drum corps performances of the 1990s and early 2000s as "retro." This is a short clip from the corps' performance at The Dream, one of the more famous drum corps contests on the East Coast. This annual event was held at Roosevelt Stadium in Jersey City, a baseball stadium that was demolished in 1985. Such stadiums held quite a number of contests, and it was not unusual to hear corps members talk about how strange it was to march on dirt, especially over the pitchers' mounds that were left in place. The classic look of the Cadets' West Point uniforms has been a constant for the group for decades. This is one of the most remarkable early drum corps videos on the Internet, of the Troopers' 1967 performance at Cotton Bowl Stadium. The corps stopped in Dallas on the way home to Casper from the VFW Nationals in New Orleans, where they took second to the Cavaliers. CBS devoted more than 12 minutes to presenting the corps during the halftime of a Dallas Cowboys/Green Bay Packers game. Note how the drill, typical for the era, was based on squads that stayed intact throughout the show. Among the many elements of note is the ongoing drum beat through "The Impossible Dream." Corps were required to stay within a specified tempo range during an entire show, even in the concert standstill productions that took the most liberties with music. The horns doing a feature all by themselves, sans drums, was rather dramatic for the time. Take a look at how narrow the bass drums were, compared to today, and how slings and leg harnesses supported the snares and single tenor drums. Vest carriers and t-brace supports for percussionists didn't come into vogue until the second half of the 1970s. At the 1969 VFW Championship in Philadelphia, Santa Clara Vanguard took 13th place in what was only their third season as a drum corps. Two years later, they would become VFW National Champions. This is also from the 1969 VFW National Championship. The corps kicked things off with "Conquest," from the 1947 movie, "Captain from Castile." This is the first year the Crusaders performed the selection, and it has been a trademark for the corps ever since. The rhythmic "hook" sneaks into many of the group's productions, even in the modern day. In the drum solos of "Pop Goes the Weasel" and Dave Brubeck's "Unsquare Dance," you'll hear percussion innovator Gerry Shellmer's early use of timpani and mallet keyboards. The latter piece was noted for perhaps being one of the first uses of unusual rhythmic meters on the field. According to percussion instructor and arranger Charlie Poole, bell player Tim VanCamp had to show up at every show not knowing if he would be playing or not. The managers of the competing corps would have a meeting prior to each competition and decide only then if they would allow the bells to be used in the contest. The corps ended up taking a penalty for the use of the non-legal instrument at the VFW Championship. Poole says that the snare and tenor drums had to learn two versions of the drum solos, depending on if the bells would be allowed to carry the melody or not. Listen to the power of this New Jersey-based "All-Girl" division corps at the 1971 VFW National Championship. Formed in 1938, in the mid-1970s, the Bon Bons competed three times at the DCI World Championships. Today one of Drum Corps International's most decorated corps, the Blue Devils' first competitive season as a drum and bugle corps was not until 1971. Two years later the Concord, Calif., corps would compete for the first time at the DCI World Championships. This is a short clip from the Madison Scouts' 1971 production, which featured a lot of the same music from the corps' much-discussed 1970 "Wizard of Oz" show. That earlier production was one of the first to employ the use of costumes, which were not yet allowed by the veterans' organizations. The 1970 show also included corps director Bill Howard's daughter as a guest performer, Dorothy from "The Wizard of Oz." Corps that utilized such visual devices had to leave the costumes behind to compete at state and national contests. Larry McCormick, a former snare drummer, instructor and arranger for the Cavaliers, conceived the production for the Madison Scouts a year before he did the same for Cavaliers' infamous "Circus Show." Larry went on to found McCormick's Enterprises, a major distributor of marching activity supplies, and also founded Marching Bands of America, which is now known as Bands of America and Music for All. Just a year before the formation of DCI, the Cavaliers' 1971 show was responsible for the sale of hundreds of T-shirts that referenced the production with the drawing of a gravestone and the inscription, "The day drum corps died." Despite being referred to as "The Circus Show," the circus theme is only one part of the entire production. At the time, many considered it sacrilege when the color guard rifles danced the Irish jig during "The Irish Washerwoman." According to Cavaliers alum Chris Hartowicz, the members of the rifle line trained at a Chicago Irish dance studio to learn the steps. In retrospect, it seems strange that the show created the buzz amongst fans that it did, as most of the show was quite traditional. 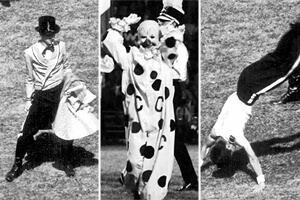 However, the addition of a costumed circus master, tumbler, clown and juggler pushed many fans to the edge of what they had ever thought a drum corps performance could and would be.